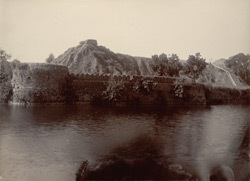 of an older fort when he captured Bharatpur from a rival Jat chief in 1733. Situated at the north-west corner of the walled city, it was built with massive double ramparts reinforced by eight bastions, surrounded by a wide, deep moat, and proved to be almost impregnable. This view shows the mud and rubble crenellated walls with the bastion projecting at left, earth ramparts within, and the moat in the foreground.